As the days slowly start getting longer and warmer we start to think more about preparing for the gardening season that is just around the corner. I would like to thank Beth for her email who is also one of are readers on her question about Square Foot Gardening. Square foot gardens are a very simple and easy way to grow a good variety of vegetables in a very small space. Square foot gardens are divided into one foot squares of soil, which are then planted according to the type of vegetables that you intend to grow. Of course the size of your square foot garden depends on how much space there is in the garden to build raised beds that you are going to plant your seeds or plants in. The basis of building a square foot garden is to have a plan to where you can plant vegetables side by side that compliment each other as they grow. For example planting corn and peppers, onion and peas or tomatoes and squash in unison together. Remember when building your square foot garden to keep in mind to place it where there is plenty of sun ( at least 8 hrs) and if possible to use a drip irrigation system to water the garden. 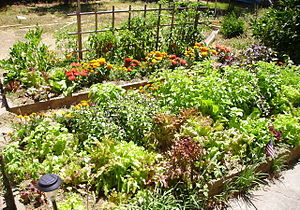 Checkout our related articles section where you will find some great square foot gardening diagrams that will give you a idea on how to design your garden using the square foot method. Patti Moreno, The Garden Girl & Mel Bartholomew of Square Foot Gardening, discuss what gardeners are doing in the month of February. Square Foot Garden Fever – Why Square Foot Gardening?